I hope everyone has seen the videos of Lou Zocchi discussing dice. In the videos he argues (quite well) that typical dice are manufactured in such a way that causes them to be misshapen causing both their overall shape to not be perfectly round and their edges to be improperly rounded. He (and others) have suggested that this misshaping causes the dice to be like an egg in that the die will more often roll with the sides of the “egg” displaying rather than the poles. So I decided to do some tests of my own to see if there was any weight to this idea. I have often seen individuals do dice rolling studies and come to the conclusion that the distribution of rolls is fairly even despite the perception that a die doesn’t roll well. I’ve seen larger studies with rolls in the thousands giving more complex conclusions. As I’m not looking to roll dice thousands of times to confirm distributions, I decided to look into the misshapen “egg” concept of my 7 d20s. Is my perception of the dice (good/cursed) have some connection to their overall shape? If so, that would be suggestive that there is something to the idea that the shape of the die affect die results. I have 7 d20s and each I have obtained at different times, and each I have found performs well or more often than not seems to roll low numbers. Right away, there seems to be some credence to the idea of dice shape given that those with the lowest standard deviations seem to perform better. It also indicates that when the dice were manufactured might matter as the dice from the 1990s all have broad standard deviations. Obtained in what I believe was a BD&D Red Box in the mid 80s, it was one of those dice which came with the number unpainted (one used a provided white crayon for the user to fill in the numbers) and sported very sharp edges on each face. What’s interesting about this die is that the number distribution is different from modern d20s. Notice, for example, that the opposite number from the 20 is a 4 (not a 1) and the opposite number from the 19 is a 7 (not a 2). There is very little overall deviation from the mean axis length on this die with the deviations being in the hundredths of millimeters. This die came from a 4E Essentials Red Box and was manufactured with what seems like modern techniques, having painted numbers and rounded edges. Despite that, this die’s overall shape is comparable to the Green in that there is very little deviation from the mean axis length. Unlike the Green, the number distribution here is using the now-common modern number distribution. For example, the opposite number from the 20 is a 1 and the opposite number from the 19 is a 2. The variation is slightly higher on axes 2, 3, and 8 but overall still quite tolerable. I’ve never used this die, but with the shape being quite good I intend to use it to see how well it seems to do in game. This die was from a set purchased in 2009, and like Black the number distribution is modern and its shape has little deviation from the mean. I use this die often and it has always done well for me in that it rolls a good range of numbers. Now we start getting into the dice I obtained throughout the 1990s. This particular die is one of three blue die so I’ve named them based on the subtle characteristics of each. In this die one can see that the standard deviation is much higher than the previous dice noted above, and more interesting is the clear indication that the die is egg-shaped. 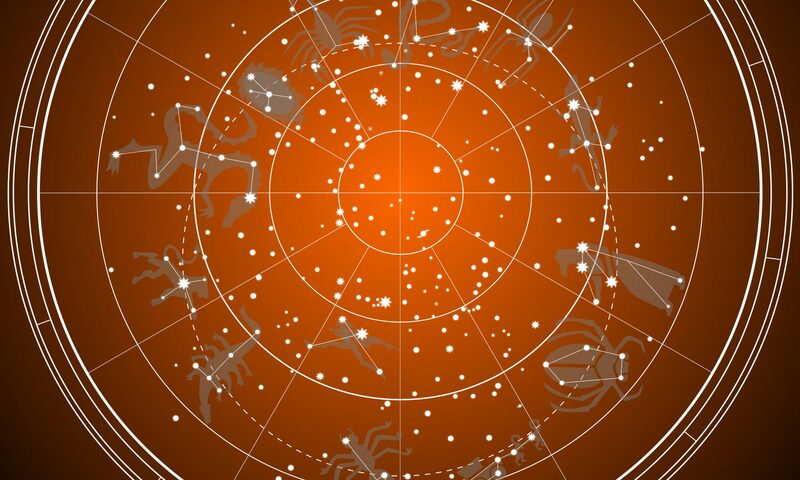 This is visible by the axis on the 20 (and 1) and the 3 faces that surround it being positive numbers and the others negative. The deviation of axis lengths increases. Though not as obvious, there is some bulging here when you look at where the axes lie in relation to each other. What is interesting with this die is that despite being from the 1990s, the number distribution is not modern. For example, the opposite number from the 19 is a 5 (not a 2) and the opposite number from the 18 is an 8 (not a 3). I don’t use it that often, but seeing these numbers I wonder if I ever will. Further deviation compared to the other die with elongation of the die along the first axis (like Blue-standard above) with modern number distribution. The worst offender by far. Like Pink and Blue-standard, this one has elongation of the die along the first axis. This is one of those dice I have come to use when, as a DM, I would rather not have a monster or trap hit a player’s character. A perception of how dice perform without data to support that performance is a dangerous thing. I have always seen certain dice as consistently bad in that they never roll high or always seem to roll low, which in general translates to an overall skewed rolling result. 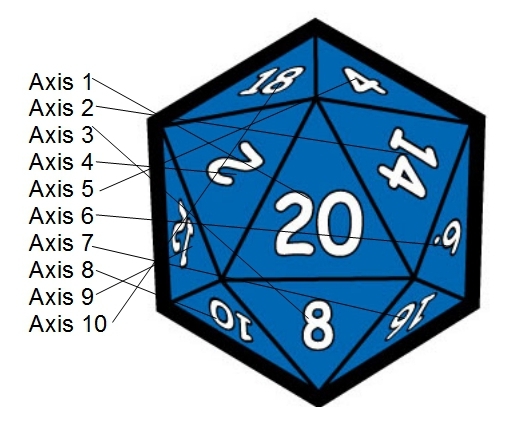 The measurements I’ve taken of each of the 7 d20s seem to confirm what I perceived. However, despite the elongation of some of the dice (which Lou Zocchi mentions in the videos) there are 2 points which may make the shape data above not very meaningful. The idea of an egg shaped die, having the numbers at the poles less likely to appear, isn’t a good analogy. An egg, a true egg, has a curved surface which causes it to try to achieve a rest state on its side. Dice however have faces which counteract forces that would cause egg-like rolling. With the distances of the above deviations from the mean of the axis lengths being extremely small (being in the tenths or even hundredths of millimeters) and the mass of the die being quite small, such variations would likely not effect a die roll of the spherical-shaped d20 to a noticeable degree. Despite these two points, the perceived performance of the dice and their axes deviations from the mean is certainly suggestive and cannot be completely ignored without complete rolling statistics for each die. Until then, I’m certainly going to stay away from those die that have an overall standard deviation above 0.084 mm. Interesting that you did this study. I asked myself a similar question. I have 4 sets of dice and kept telling myself that one set rolls better than the other. Here is the result of my “experiment”. Although it probably needs more testing, the results are fairly interesting. Actually, I reference your study directly in my introduction (see the link that says “seen individuals”)! Thanks for the shout out. Dice are fascinating. Makes you wonder.